Episode #163 – You Better Find Out What is Stressing Your Customer Out! The quickest way to increase your sales is to quit selling features and start selling solutions. You need to get to the emotion of why someone is buying your product. We live in an extremely selfish society right now. It’s a society that wants the solution to their problem, now. And I mean instantly. Start with an FAQ list. Take a chunk of time and write down every question you’ve ever been asked about a profit center. Remember you want to do this one-by-one. Although several profit centers will have a common question area, the people that buy one particular product over another have specific questions. For example, the people who rent a pontoon from us for one day vs. the people that rent a dock slip for a boat they own will both want directions to the marina, at the same time they will have product specific questions. The reason I start with the FAQ list is to find the themes of what is stressing out your customer. When you find the themes you can offer solutions as to how you are the best person to fix this problem. This is critical. If you do not offer solutions you will be directly compared to another product. When you offer solutions you develop an emotional bond. The thing is… and I said it earlier… people want things instantly! Therefore, do it quick. You need to offer solutions at the same time you show features. Sure dance studios teach balance, coordination, and grace to young students. But do you think mom really cares that her daughter is graceful? She might think she does. But honestly, she wants a photo of her daughter and her dance team hanging on her wall at home. She wants to see her daughter on stage having fun with her new friends and feel like a good mom for providing this opportunity. She wants her daughter’s time occupied where she is safe so she doesn’t have the opportunity to hang with a “bad crowd” and go down the path to drugs so when her daughter turns 40 she doesn’t find her still living in her basement. OK that might be an extreme example, but try this pitch… “Hey mom, look at this, you can log in to our private class cam and take a look at how her lesson is going, right from your phone” – Do you think mom might get peace of mind knowing when she’s at work she can log in and see her daughter at dancing class… learning balance, coordination and grace? 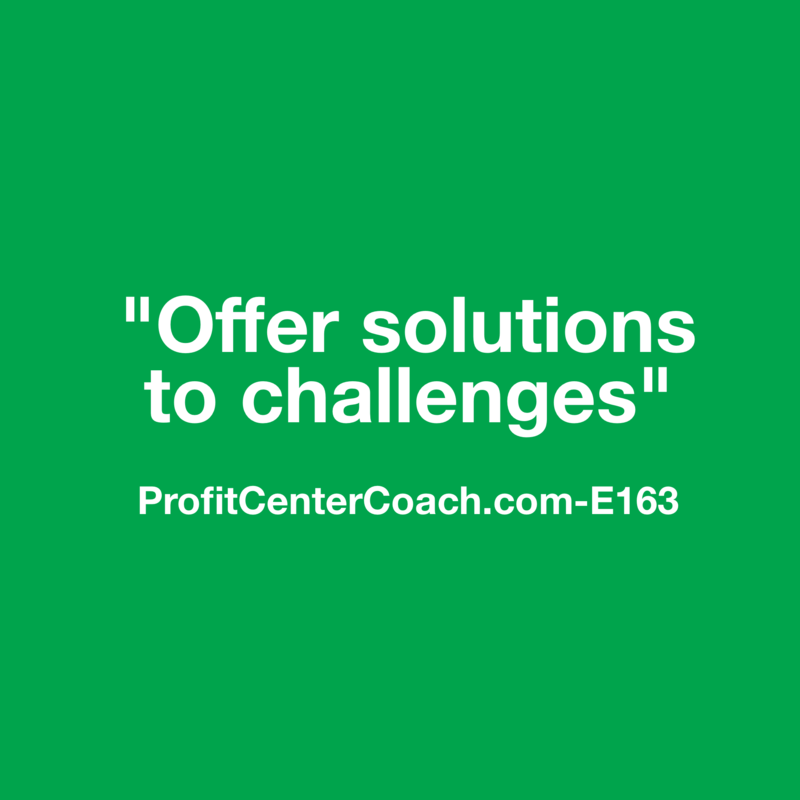 Find the challenges your customers have and sell them the solution your product brings. What is the one time you bought a product because the solution was provided instead of the features? 1- Write an FAQ page of all the things you’ve been asked about a profit center in your business. This will help you determine the challenges your customers have… it will also be a great edition to your website! 2- Thinking about the challenges you just discovered from your FAQ exercise… how does your product address it and offer a solution? 3- Sell the solutions, start today with one-on-one conversations and in your posts!!! Episode #164 – Are You Good… or Just Kidding Yourself?